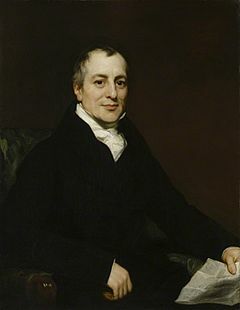 Portrait of David Ricardo by Thomas Phillips, circa 1821. This painting shows Ricardo, aged 49, just two years before his early death. David Ricardo (18 April 1772 – 11 September 1823) was a British political economist. He was one of the main thinkers behind Classical economics, together with Thomas Malthus, Adam Smith and John Stuart Mill. Today, he is mostly known for his theory of comparative advantage. This theory suggests that a nation should concentrate its resources only in industries where it is most internationally competitive and trade with other countries to obtain products not produced nationally. Ricardo promoted the idea of extreme industry specialization by nations, to the point of dismantling internationally competitive and otherwise profitable industries. In this thinking Ricardo assumed the existence of a national industry policy aimed at promoting some industries to the detriment of others. For Ricardo some form of Central Economic Planning was a given. Ricardo's theory of comparative advantage has been challenged by, among others, Joan Robinson and Piero Sraffa. Nevertheless, it remains the cornerstone of the argument in favour of international free trade as a means of increasing economic prosperity. The theory of comparative advantage was the forerunner of the push towards globalization via increased international trade, the guiding theme in economic policy currently promoted by the OECD and the World Trade Organization. David Ricardo Facts for Kids. Kiddle Encyclopedia.